Boland’s Herbert Boois beating a challenge by SWD’s Dillon Smith to score a try is attached. The Carfind.co.za Iqhawe Week on Tuesday dished up mixture of tight matches and big wins in an entertaining second day’s play at the Bill Jardine Stadium in Johannesburg, in which four teams remained unbeaten. SWD, Western Province, the Pumas and Griquas continued to stamp their authority in the tournament following victories on the opening day on Monday. 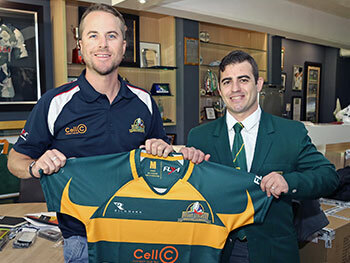 The Under-15 tournament, which is a joint venture between SA Rugby and the SA Rugby Legends Association, will conclude on Thursday following a well-deserved rest day for the players on Wednesday. The main game will feature SWD and Western Province. SWD showed they were a force to be reckoned with in their clash against Boland as their forwards and backs combined well, while they capitalised on their point-scoring chances to register a 19-5 victory. The team from the Southern Cape dominated possession and territory throughout the match, and this paid off in the first half particularly as they scored three tries before the break. They supported this with a solid defensive effort, which forced Boland onto the back-foot. Boland stepped up their defence immensely in the second half and managed to shut out SWD, while they scored their first and only try of the match to go down 19-5. The clash between the Golden Lions and Western Province, meanwhile, was a tight-tussle from start to end. The home side scored a try and penalty goal in the first half to take an 8-0 lead, but two tries in two minutes by Western Province pushed them 12-8 ahead. With both teams battling to breach the defence in the dying minutes, they opted for penalty goals to add to their score, which handed the Cape side a 15-11 victory. The Pumas and Blue Bulls were involved in an equally hard-fought battle as both teams used their forwards in an attempt to stamp their authority. 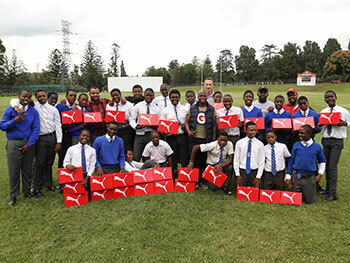 Each team scored a try in the early exchanges, while the Pumas later opted for a penalty goal to take an 8-7 lead after battling to force their way through the defence. The Blue Bulls struck first after the break to reclaim the lead, but back-to-back tries by the Pumas late in the half allowed them to secure an 18-12 win. Griquas in turn delivered a well-balanced performance on attack and defence against KwaZulu-Natal, which guided them to a convincing 38-7 victory. The Durbanites scored the first try three minutes into the match, but that proved to be their only points as Griquas put their bodies on the line on defence. Their attack was equally effective as they used their forwards to force their way over the advantage line and spread the ball wide when necessary, which earned them six tries. Border’s big forwards also laid a solid foundation in their clash against Free State, which set them up for a rewarding 36-0 victory. The side did well to apply pressure on Free State throughout the match and it paid off as they forced their way over the advantage line consistently. This combined with their ability to convert their chances into points saw them score two first-half tries, while they added four more after the break. Free State, meanwhile, tried hard to make their presence felt on attack, but the solid Border defence denied them from crossing the tryline. The first half between the Falcons and Griffons was hard-fought as each team managed to cross the tryline once, with the Falcons taking a 7-5 lead. But the Kempton Park side dominated the second half as they scored four tries in 14 minutes, which saw fullback Rivano Do Amaral earn his hat-trick, while he also added four conversions for a personal total of 23 points. The Griffons in turn were unable to breach the effective defence again, which saw them go down 33-5. 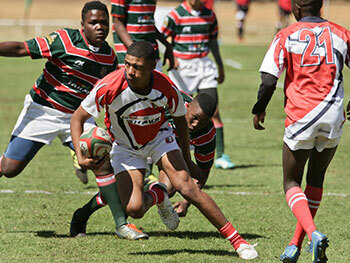 The Leopards, meanwhile, overturned a 10-5 halftime deficit against Eastern Province as they ran in three second-half tries for a total of four for the match to secure a 26-15 victory.